The Vdara’s accommodation consists of 1495 suites that are arranged over 57 floors. These suites have been fashioned by some of the USA’s top interior designers. The result is a modern, sophisticated style, complete with all the high-tech amenities and luxury comforts you could wish for. Enjoy spacious bathrooms, plush pillows, luxury linens, custom-made mattresses, and gourmet kitchens. Sensational views of the surrounding mountains, glittering CityCenter and The Strip are part of the picture. All suites have internet access. A Deluxe Suite is far from basic, and includes a kitchenette, and a king-sized bed with custom-made Sealy pillow-top mattress. For entertainment, there’s a media hub for MP3/camera/DVD/games console, and so on. For cooking, there is a two-burner cooker, under-counter fridge and dining table for two. Relax in the extra-large spa-style soaking bathtub. 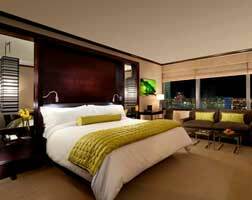 A Vdara Suite is a third bigger, and has a separate sitting area with a pull-out queen-sized bed. The cooker is full-sized, the fridge is too, and there is a washer/dryer as standard. A City Corner Suite has wonderful views from more angles. In addition to the normal suite spec, it also has a microwave oven. These suites can be connected to an adjoining Deluxe Suite for additional accommodation. If you book an Executive Corner Suite, there are some further features and benefits: a separate guest WC, a separate entertainment area, a dining table for four, and large flat-screen TV’s in the living and bedrooms. For breathtaking 270° views, you’ll definitely be impressed by the Panoramic Suite. Here, you’ll get a perfect view of the CityCenter and surrounding areas, from the bath, bed or kitchenette. These suites are also available with a connecting Deluxe Suite for added convenience. If you’re in town to do business or are entertaining guests, the Hospitality Suites on floors 42 to 48 are perfectly-sized and equipped. The suite has two bedrooms with en-suite bathrooms, a guest WC, dining table for up to six and fridge for your wine. Part of the service includes complimentary limo to/from the airport, access to a dedicated concierge service phone line, four spa passes for guests and speedy invited guest check-in. On top of the Vdara, in every respect, are the Penthouses, on floors 54 to 56. These are available in either one or two-bedroom versions. They are as luxuriously-equipped as the best of the other suites, with all the little luxury touches like plush robes and slippers, plus passes for the Spa. Showers are frameless, glass-enclosed walk-in versions, with built-in seats. The mini-bar comes fully stocked, naturally. Rising above it all, on the two top floors are the two-storey penthouses, either one or two-bedrooms in size. Open and airy, they have the bedrooms upstairs, leaving loads of living room downstairs. If you require, long-term suite rentals are available, for a minimum 30-day stay.